John Glenn's (b. 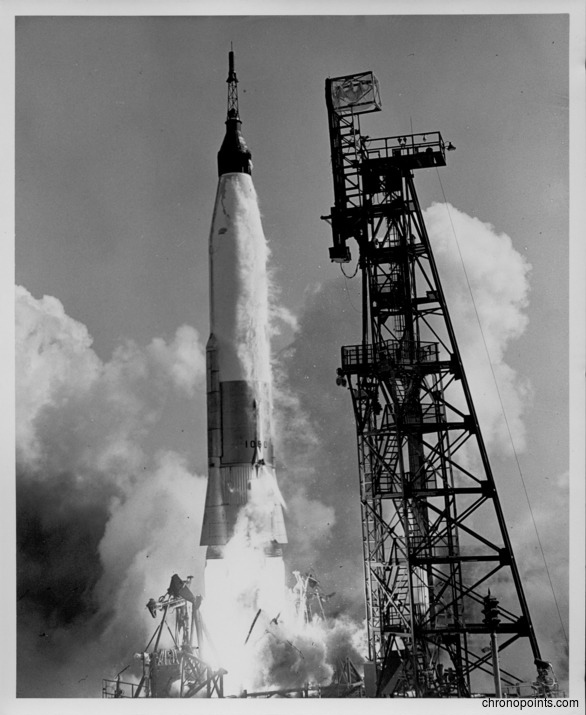 1921) Mercury-Atlas vehicle (MA-6) lifting off the launch pad at Cape Canaveral Air Force Station Launch Complex 14 (LC-14) on February 20, 1962. 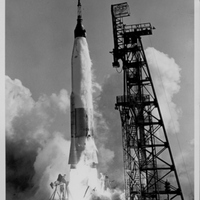 This was the first manned flight of a Mercury-Atlas spacecraft, which occurred after a few delays. Glenn would become the first American to orbit the Earth. Glenn was later feted in parades from Cocoa Beach, Florida, to New York City, New York. Original black and white photographic print, February 20, 1962: Private Collection of Dr. Calvin D. Fowler. Digital reproduction of original black and white photographic print, February 20, 1962. "MERCURY PROJECT SUMMARY (NASA SP-45)." National Aeronautics and Space Administration. http://history.nasa.gov/SP-45/ch5.htm. “Friendship 7 Lift Off at the Launch Pad at Cape Canaveral Air Force Station Launch Complex 14.” RICHES of Central Florida accessed April 26, 2019, https://richesmi.cah.ucf.edu/omeka/items/show/5023.